(20288.71.199.5, Chickasaw Council House Museum Collection, OHS). Located in south-central Oklahoma, Johnston County contains 658.29 square miles of total land and water area. It is bordered by Pontotoc County to the north, Coal and Atoka counties to the east, Bryan and Marshall counties to the south, and Carter and Murray counties to the west. The county was created at 1907 statehood, the name honoring Douglas H. Johnston, governor of the Chickasaw Nation in 1898–1902 and 1904–39. Tishomingo is the county seat, and Bromide, Mannsville, Milburn, Mill Creek, Ravia, and Wapanucka are other incorporated towns. U.S. Highway 377/State Highway 99 runs north-south through the county, connecting Ada to Tishomingo. Other state highways include 1, 7, 22, 48, 48A, and 78. The county's northern portion lies in the Arbuckle Mountains physiographic region and is dominated by rock outcrops and rolling hills, and the far southern section is in the Coastal Plains region, which is more suitable to farming. The Washita and Blue rivers and Pennington Creek drain the county as part of the Red River basin. A northern appendage of Lake Texoma protrudes into southern Johnston County, southeast of Tishomingo. Evidence of prehistoric American Indian camps and knapping stations where those groups cast their weapons and tools from native lithic material, exist in the region. The majority of these archaeological sites are Archaic (6000 B.C. to A.D. 1) or younger. There is little historic record of seventeenth- or eighteenth-century exploration of the area. In 1820 the U.S. government granted the Choctaw ownership, with most moving to the Indian Territory in the early 1830s. In 1834 the Dodge-Leavenworth Expedition traversed the present county on their march west to negotiate peace with the plains tribes. In the late 1830s the Chickasaw were relocated to the western part of Choctaw territory, and many settled in this area. In 1842 the U.S. Army established Fort Washita nearby (in present Bryan County) to protect the Chickasaw settlers from Plains Indians and whites. In 1853 on Pennington Creek the Chickasaw erected a council house, around which the community of Tishomingo emerged. In 1855 the Chickasaw separated from the Choctaw, forming their own nation, which included the region. Tishomingo became the capital, and in 1856 the nation constructed a brick capitol building. Several missions and mission schools served the Chickasaw Nation. In 1844 the Methodist Episcopal Church established the Pleasant Grove Mission School near present Emet and opened the Chickasaw Academy four miles southeast of Tishomingo. In 1852 the Wapanucka Female Manual Labour School opened, operated jointly by the Board of Foreign Missions of the Presbyterian Church and the Chickasaw Nation. The Chickasaw government joined the Confederacy during the Civil War. The Federal order to evacuate Forts Washita, Cobb, and Arbuckle to Fort Leavenworth in Kansas was relayed to Lt. Col. William Emory, who camped near Pleasant Grove Mission while he gathered his Union troops. Confederate forces soon arrived, and they used Wapanucka's stone building as a hospital and prison. Before and after the war major transportation routes crossed the area. The Texas Road passed through the future county's eastern portion, serving as an early regional transportation artery. Military roads also connected Fort Washita to Forts Gibson, Arbuckle, and Sill. At the beginning of the twentieth century an intrusion of railroads reworked the region's settlement patterns, initiating new townsites and relocating others. In 1900–1901 the St. Louis, Oklahoma and Southern Railway, which the St. Louis and San Francisco Railroad (Frisco) purchased in June 1901, laid tracks north-south through the area. In 1902 the Western Oklahoma Railroad, which became the Choctaw, Oklahoma and Gulf Railroad (CO&G), constructed a line southwest to northeast through the present county. In 1908–10 the Missouri, Oklahoma and Gulf Railway (MO&G), acquired by the Kansas, Oklahoma and Gulf Railway in 1919, laid a north-south line in the far eastern portion of present Johnston County. In 1911 the MO&G built a short excursion spur west to Bromide, an early-twentieth-century health resort, capitalizing on the vicinity's natural springs. At the end of the twentieth century the Burlington Northern and Santa Fe, which acquired the Frisco in 1980, was the only railroad left in the county. Ranching began playing an important economic role while the area was still part of the Chickasaw Nation. Ranchers such as Sam Daube, Cyrus Harris, and James Riley grazed herds there prior to allotment, which was finalized in 1906. After 1907 statehood newly created Johnston County had a number of successful ranchers, including Frank Gillespie and Felix Penner, who had married Harris's daughter. Penner expanded Harris's livestock operations, which lasted through the twentieth century as Penner Ranch. In 1907 residents owned 16,186 cattle and milk cows, a number that increased to 27,273 in 1935. By 1963 there were 47,400 head and by 1978, 70,000. In 2000 ranchers owned 45,000 milk cows and other cattle. Farming also spurred the economy. Tenant farming prevailed through the first half of the twentieth century. In 1910 tenants, including sharecroppers, operated 1,638 farms, while owner-operated farms numbered 390. In 1925 the Chapman Estate, with J. O. Chapman as president, purchased a large amount of land and divided it into eighty-acre tracts. Each had a modern house (with electric lights and running water), a chicken house, a double garage, a large barn, granaries, and sheds. These farms were designed to raise diversified crops, including cotton, corn, and alfalfa, and the estate recruited experienced farmers, even including sixty Mexicans who had farmed in southern Texas. In 1935 there were 1,336 tenant farmers compared to 329 full owners working their own land. In 1940 tenancy fell to 1,086 and ownership climbed to 433. Tenancy almost ended after World War II, due to a large migration from rural areas to urban centers and the widespread mechanization of agriculture. In 1950, 302 of Johnston County's farm operators reported themselves to be tenant farmers. Over the century diversified farming increased. In 1907 corn, with 84,347 acres planted, and cotton, with 34,824 acres, led the county's field crop production. By 1934 farmers had planted 24,917 acres of corn, 20,309 acres of cotton, and 10,710 acres of hay and sorghum. By 1963 the crops were further diversified with 7,200 acres of oats, 4,350 acres of peanuts, 3,600 acres of alfalfa, 3,400 acres of sorghums, 3,000 acres of barley, 2,700 acres of cotton, 900 acres of corn, and 750 acres of wheat. The Chapman land was sold to the U.S. Army Corps of Engineers prior to Lake Texoma's impoundment in 1944. The Tishomingo National Wildlife Refuge, established in 1946, took a portion of the land and temporarily used some of the farm buildings as employee residences and the farm store as headquarters. The importance of agriculture in the county's history is illustrated by the presence of several institutions. In 1909 Oklahoma's forerunner to the 4-H organization began in Tishomingo as the Boy's Corn Club. 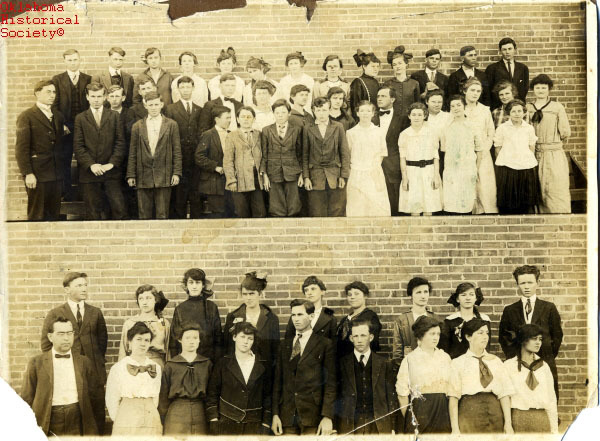 One year earlier the Murray State School of Agriculture began its first classes in Tishomingo. In 1972 the community college's name changed to Murray State College. In 1929 construction began on the Tishomingo National Fish Hatchery, which breeds and maintains sport and endangered fish. Although oil and gas have not been produced in large quantities (5,405 barrels of oil and 16,759 million cubic feet of gas in 2000), mineral extraction has been a constant activity in Johnston County since the nineteenth century. Granite, glass sand, limestone, dolomite, gravel, asphalt, iron ore, and manganese have been mined. Small deposits of lead and zinc, as well as one small vein of gold, started a short-lived frenzy in the early twentieth century. Granite quarries and the mining of sand and gravel remained an economic staple. In 2002 Johnston County led the state sand and gravel production, with 3,429,491 tons. The county led in granite extraction, with 2,355,236 tons, and also produced 1,137,685 tons of limestone. When the county organized at 1907 statehood, the population stood at 18,672. By 1920 the number had climbed to 20,125. As the cotton industry withered and the Great Depression took hold, thousands left, and the U.S. Census registered 13,082 in 1930, 15,960 in 1940, and 10,680 in 1950. In 1970 the county reached its lowest population when the census reported 7,870. The number of residents rebounded to 10,356 in 1980 and remained steady at 10,513 in 2000. The 2010 census counted 10, 086 residents, of whom 73.1 percent were white, 15.5 percent American Indian, 1.9 percent African American, and 0.2 percent Asian. Hispanic ethnicity was identified at 3.9 percent. A number of notable Oklahomans have come from Johnston County. Included are several governors of the Chickasaw Nation, among them Cyrus Harris, Henry Johnston, Jonas Wolf, and Bill Anoatubby. Te Ata (Mary Frances Fisher), a traditional Chickasaw storyteller, was born in Emet. Entertainer Gene Autry was raised at Ravia. Politicians William "Alfalfa" Bill Murray and his son Johnston Murray called the county home. Neill Armstrong, who coached the Chicago Bears, was also a county resident. Johnston County has numerous historical sites, recreation areas, and other amenities. Five sites in Tishomingo are listed in the National Register of Historic Places, including the Chickasaw National Capitols (NR 71000663), the original log structure and the current building. In 1897–98 the Chickasaw built a large, granite building, replacing the one destroyed by fire. In 1910 the county purchased the structure to use as its courthouse, and in 1992 the tribe reacquired it. The Chickasaw Council House Museum is also located in Tishomingo. The White House of the Chickasaws, Douglas H. Johnston's home, (NR 71000662) and the Wapanucka Academy Site (NR 72001065) are other county locales in the National Register. In 1960 Johnston Memorial Hospital opened its doors in Tishomingo, providing health care to the region's residents. Lake Texoma, Blue River, and the Tishomingo National Wildlife Refuge attract outdoor enthusiasts, providing another source of income to area businesses. Daily Oklahoman (Oklahoma City), 20 September 1925 and 1 June 1992. Carl Reubin, ed., Johnston County History, 1855–1979 (Tishomingo, Okla.: Johnston County Historical Society, 1980). Frances Thetford, "Johnston County," Oklahoma's Orbit: The Magazine of the Sunday Oklahoman (Oklahoma City), 29 January 1961. Muriel H. Wright, "Wapanucka Academy, Chickasaw Nation," The Chronicles of Oklahoma 12 (December 1934). Larry O'Dell, "Johnston County," The Encyclopedia of Oklahoma History and Culture, https://www.okhistory.org/publications/enc/entry.php?entry=JO013.